The leaves are falling and we're getting blown all over the place. This can only mean one thing; Autumn is well underway and Winter is just around the corner! If last year is anything to go by, it's going to be wet and very windy. Overall, we escaped the snow and ice last year compared to previous years but we never know what's going to happen each Winter. Now is the time to start getting ready for Winter driving and staying safe. We've put a short guide together with tips on how to stay safe and warm this Winter. If you have any more, jot them down in the comments below - the more the better! It may sound like a stupid thing to say but you'd be surprised. When the clocks go back there is usually a spike in accidents as people forget to turn their lights on driving home from work. If it doubt, turn them on. Make it a habit when you get in your car to just turn the lights on. Most modern cars have automatic lights but you should never rely on this clever little feature. Always check they are on when you are driving. The last thing you want is to run out of engine coolant, oil, or screen wash so make sure you're all topped up. Do it now before it becomes a problem later on. 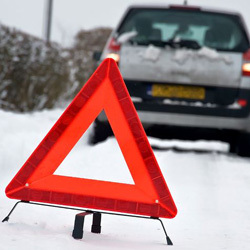 For winter driving make sure the engine coolant has the correct mix with water to prevent freezing (check the coolant and car manual for details). If in doubt, whip the car into your local garage and ask them to check and top up. It's only a 10 minute job which won't cost the earth. Regardless of the weather, you should always make sure you have a portable warning triangle and first aid kit in the car. Remember, you may not actually use it for yourself but another broken down motorist or someone else in trouble. Winter = Rain. So double-check the tread on your tyres and replace them if they're low. Don't wait for them to reach the minimum level (currently 1.6mm) - this is your life and the lives of others we're talking about. If they're low and below 3mm get them replaced. If you're in an area with extreme levels of snowfall, buy some snow chains to give you that extra grip. We all hate the feeling of being cold in the car waiting for the heating to come on. Make sure it all works now before you're forced to spend your trips to work in the freezing cold. Whilst you're checking the heating, just double check the heated windscreen works too - you'll need to check it on a morning with condensation on the windscreen. You'll be cleaning your windscreen a lot during the winter so make sure the blades are in tip-top condition with no streak marks or vibrations. Try cleaning them first with some vinegar. The same goes for the windscreen washer jets that can get clogged up. Clean them and point them at the windscreen - don't find yourself cleaning the pavement or worse still, the car behind! Turn all the lights on you can including fog lights, main beam, dipped bean, side lights, and indicators and replace any broken bulbs now. Do it before the clocks go back and you may be driving more in the dark than in daylight. It might sound blindingly obvious, but it's difficult to drive when the windows are covered with ice, but we've all seen people driving along, peering through a letter box sized gap in the ice on their windscreen! Before you set off make sure you have removed all the ice from all the windows and clear the windscreen inside. 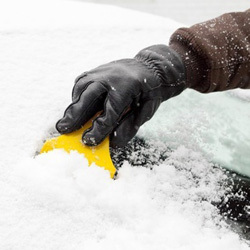 Use a scraper or de-icer to make the job easier. It's better to wait a few minutes in the car whilst everything clears up than drive into the first tree you see, or worse still, a child on their way to school! If the roads are icy or bad weather is forecast, only drive if you absolutely need to. It's not worth the risk, especially if it's something that can wait for another day. You can always order online rather than travel to the shops. Before you leave, especially on a long journey, check the weather forecast and traffic updates. You may find that the roads are closed anyway so you'll be better off staying in with a hot water bottle and a hot cuppa! Be prepared and keep a couple of blankets, bottles of water, snacks, and a shovel in the boot of your car. A torch and first-aid would also be recommended. If you're heading out on a cold night, wear appropriate clothing or at least take warm clothing with you should you get stuck or stranded. You can always keep a spare pair of gloves, a hat, and an old jacket in the car just in case. 13. And finally... buy a dash cam! For when you do have an accident (or even witness another accident) you'll need proof of what happened. If someone skids into your car you'll want evidence to prove to the insurance company and police of exactly what happened. 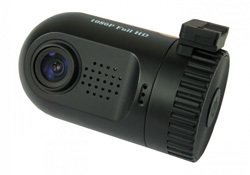 Car cameras start from under £50 and can save you a lot of hassle and gives you instant peace of mind.